Hope you’re all well and are having a lovely start to 2019! I just wanted to email to say thank you so much for helping me with my wedding dress. I’ve had so many compliments and on the day the dress was the real star! People couldn’t believe it! Thank you for all your help!!! The dress exceeded every expectation I even had!!! I will recommend your shop to anyone & everyone. Dear Knutsford Gallery Team I just wanted to say a massive Thankyou to you and for all your help with picking my dream dress. You were all amazing throughout the whole process. We had the most wonderful day at Bocconoc in Cornwall and were very lucky to have a day of Sunshine. 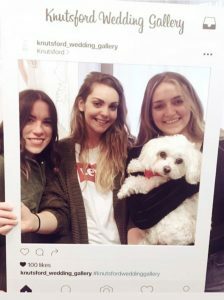 Our beautiful #kwgrealbride Francesca who said yes to the dress on with her friends looking happy in our #knutsfordweddinggallery Selfie Frame. I was dog sitting my mums #maltese Bianca who couldn’t wait to see what was going on! So spent the whole bridal appointment giving her input!! 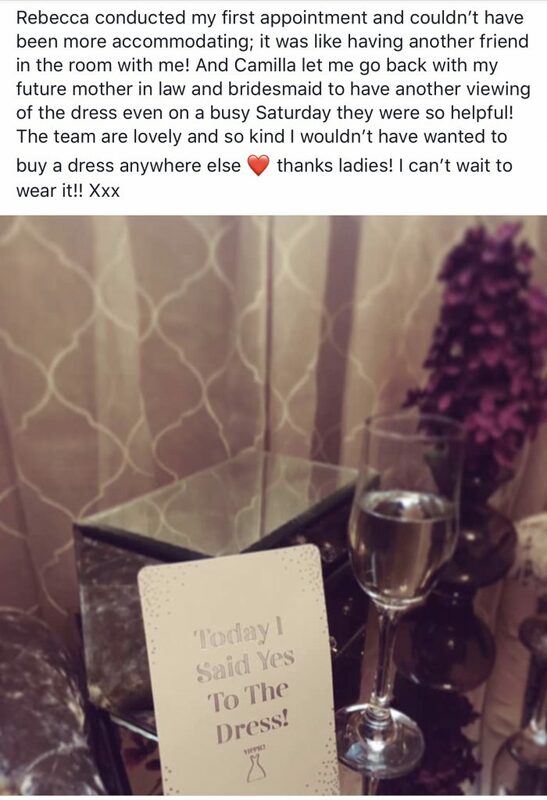 Congratulations Francesca on finding your dress. I got married on 8th September in a Rosa Clara dress purchased from your boutique, and I want to say a massive thank you! The service was excellent from start to finish and I couldn’t have wished for a more beautiful dress. I’ll send over some pictures as soon as they come through from our photographer. Many thanks Emily. Hi all, I had an appointment with Sharon on Saturday 30 June, and have decided to go with one of your beautiful dresses! It was the Studio St Patrick Zali dress, and nothing I’ve tried on since has beaten it. I can’t wait to get started. I also want to thank you so much for the fantastic experience you gave us when we popped into the shop in June, and of course for your amazing expertise. I feel very lucky that ‘the’ dress happened to be in your shop, because you were easily the most knowledgeable and creative bridal shop we visited. Thanks again and best wishes, Steph. My visit to Knutsford Wedding Gallery has been one of the most memorable moments of my wedding planning so far. The shop itself is beautiful with the most spectacular dresses in all different styles. Camilla made me feel like a princess and styled every look with veils and accessories according to the dress. The dresses are so different and elegant I’m so pleased I chose to come here to find my perfect dress. Grab a prosecco, take a seat … this may take some time! I decided I wanted to write my thank you testimonial following my final dress fitting appointment this weekend. But this couldn’t be a “normal” testimonial expressing my sincere thanks for the teams hard work, the great atmosphere or the beautiful selection of gowns, because my journey, and yes ladies this was a JOURNEY, was no ordinary one. After six months searching, I had set my heart on a Rosa Clara Couture dress earlier in the year and after many many phone calls trying to track down a stockist of THE dress, Camilla came to the rescue. The dress wasn’t in store, however, Camilla was able to use her contacts and the dress was flown in from Barcelona. Within a few weeks I went to see my beloved gown. Now girls, if you were anything like me you became obsessed with with the cut, the shape, the material, your shape in the dress and to the point of what direction the wind was blowing in order to give it the cudos it deserved, you can appreciate a lot was riding on this visit. The sample arrived and I was able to get it up my hips and that was it. I couldn’t even try it on fully as it was a sample size and far too small, however, when you know it’s the one you know, so it was ordered and off I went for 9 months to eat celery and drink water. 9 months later and 3 stone lighter, I returned for my first dress fitting. In steps both the amazing Fran to fit the dress and my good old friend ‘anxiety’ accompanied by his mate ‘A state of sheer panic’. The dress was hanging off me. Now, to any bride to be, this should have been a triumph and feeling of sheer happiness that the past 9 months of pain staking exercise and weight control had paid off – but it wasn’t. Is the material right? What’s that ripple? Why does the light make me look like that? Should it be fitting like that? What about the back, neck, waist, shoulders, breast plates – you name it needed sorting. Fran was nothing but amazing!! She had to refit the dress almost 3 dress sizes smaller, without losing the integrity and shape of the dress. OK, well all brides aim to lose some weight I hear you think? And it’s their job to sort the alterations? Yes it is, and believe me what Fran doesn’t know about fitting and tailoring isn’t worth knowing. In one attempt, she pretty much nailed it and the dress was starting to take shape to my new shape. However, what Fran, Camilla or anyone else wasn’t expecting to deal with was my sheer level of anxiety, nerves and worry. If you are yet to try on a wedding dress, the structure and weight is something completely different to anything you will try on again that in itself was a trauma to me. Even after my final fitting, I was still worrying and was allowed to take the 4 hour round trip back to the salon to try-on the dress one final take to put to bed any last minute niggles –which were all in my head btw. I was allowed as long as I needed, to breath and finally feel at ease in my dress, I was shown how to stand, walk and we even spoke about the affect of lighting – I know this all sounds OTT but this would have been the first time I was actually enjoying trying on my dress, feeling comfortable. And this is now what makes Knutsford stand out to me! The selection of dresses is beyond anything I have seen, their knowledge is on another level, customer service check and their fitting is beyond words –seriously this dress looks like it hasn’t even been touched. But their patience, empathy, compassion and understanding is what I want to highlight. For someone who doesn’t like the limelight and all eyes on them, I’m not quite sure how I will cope with my up and coming wedding – but I do know without Camilla and her team I wouldn’t feel the way I do, in THE dress. So to Camilla, Fran and the rest of the team. Thank you! Thank you for putting up with my neurotic thoughts and working with me. It is without hesitation I whole heartily recommend this boutique- you have been amazing to put up with me and make this beautiful dress –and for the brides out there who do struggle with confidence, or want a team that really knows what they’re on about, or a fitter that can take a dress in 3 dress sizes and have it look like it was made for you – there really is only one bridal gallery for you and It’s Knutsford! Lots of Love Marella, Stourbridge West Midlands. Dear Camilla and the rest of the team, I just wanted to say once again, a huge THANK YOU for helping me find my dream dress. It was just incredible. Everyone commented on how unique and stylish it was. Honestly, you brought my vision to life – and so much more! I felt like million dollars. You were such a pleasure to work with; your enthusiasm and professionalism made it so easy. If you had not been so amazing and kept the shop open late for me on that night in July – I may have never found my beautiful Pronovias gown. Hope this finds you all well! This is a two year late thank you! I was just going through all my wedding pictures today and realized I forgot to thank you for all your wonderful service and amazing work! My dress was better than I had ever dreamed it would be and I felt amazing on my wedding day. I honestly felt like royalty! I never got to thank you for being so supportive and patient in helping me find the right one, and for all the bespoke alterations you were so willing to make. I recommend all my friends looking for dresses to your wonderful boutique. I feel very lucky to have found you! Especially as my wedding was so short notice (two weeks!). Thank you again and I wish you all the best for the future. Hope you continue your amazing work! I’ve attached some photos as you’ve probably forgotten me! Warmest regards Zara. I just wanted to say a huge thank you for everything you did for me in the lead up to the wedding, and for helping me to find my perfect dress. You have the most beautiful boutique, and made the whole experience so magical and wonderful. I felt a million dollars on the day, and received so many compliments on my dress. It fit me like a glove. All the girls and staff at the boutique are amazing and an asset to you! I like to think of it as fate that Rachel came with me to my first appointment with you and now she has a job with you! Thank you for giving me such wonderful memories. Here are some professional and non professional pictures from the day! Feel free to put them on social media or website if you wish. Best wishes Elizabeth Keeler. Hi, I just wanted to say thank you for providing and assisting with my wedding dress. It was just what I wanted – so beautiful and unique. I promised I would send some photos in the Yolan Cris dress and here is a link of our preview so you can see some. Thank you so much for all your help I absolutely every second wearing the dress. Thank you so much for being so helpful and welcoming when I bought my dress and during all my fittings. It was the most beautiful dress and everyone commented on it. Knutsford Wedding Gallery have made finding my perfect dress the most enjoyable experience! They have been amazing throughout and well outdid any other shop I had been into before with their attention to detail and making you feel relaxed. They are always so welcoming to me, my Mum and my bridesmaids and nothing is too much trouble. They helped to build the perfect dress I imagined with their expertise and I can’t wait to wear it! Thank you! 100% recommend. 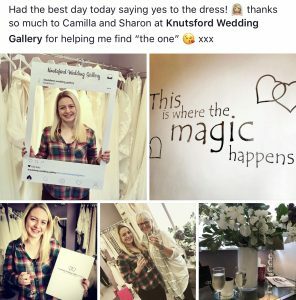 The Staff at the Knutsford wedding Gallery are amazing, they cant do enough for you, going that extra mile to ensure you have the dress you want on your wedding day. They came to my rescue when two weeks before my wedding I didn’t have a dress (this was due to another shops error! ), Camilla helped me find the dress I wanted and got it delivered to me in time. Something no other bridal shop in the UK had been able to do! I live in Scotland so this wasn’t the easiest of challenges, I’m sure! I cannot thank them enough for all the efforts. I would highly recommend them. Hi Guys, I wanted to share with you some pictures from my wedding day in the beautiful dress I bought from you! Thank you for making me feel amazing. Hi Camilla and everybody. Just wanted to say thank you for everything and for my beautiful dress. Our wedding in Santorini was unbelievable and so was the dress. Thank you to Fran as well. Hi ladies. Claire here. Just a quick email to show you a few pictures of the dress on the wedding day. It was amazing and everyone absolutely loved it! Thanks again for everything. Hope you enjoy the pictures. I just wanted to email and say thank you for all your help with my wedding dress. I felt absolutely amazing in my dress and everyone said I looked beautiful in it, I had a fantastic day and loved every minute of the wedding. I have attached some photos for you to have a look at. As we start in 2017 and the realisation that I am actually married is finally sinking it, it is time to thank those who made my special day on Saturday 19th November 2016 so memorable and what can be more important than THE dress! From the second I stepped foot in Knutsford Wedding Gallery I knew it was something special. I was treated like a princess and wasn’t at all surprised that this was the place where my wedding dress dream finally became a reality. Camilla listened to the type of dress I was looking for and gently pushed me out of my comfort zone to try dresses she knew would suit my figure… and she wasn’t wrong! With the combination of Camilla’s knowledge of her collection and Lorna’s (realistic!) input of what alterations would be possible, I ended up with a wedding dress I could only dream of! I just want to thank all the ladies at Knutsford Wedding Gallery for helping me find my wedding dress and bridesmaid dresses. They have made it the most magical experience for me and I cannot recommend them more. They have the most amazing dresses and the customer care is second to none! Hello team KWG I just wanted to share a belated thank you for helping me source and fit my beautiful Llunas Wedding Dress. We had the most stunning day and I felt like a total princess, thank you. So many amazing comments on the dress, I absolutely loved it. And it was truly perfect for our St Pauls Cathedral wedding! Please also pass my thanks onto Fran. Just wanted to say a huge thank you to you and your team for giving me the perfect dress for my wedding day!! You are true professionals at what you do!!! Had an amazing experience with all of you! Special thanks to lorna X Would you like any pics of my Pronovias dress on the wedding day? My daughter must be the fussiest person ever looking for a wedding dress even taking me abroad but none of them as beautiful as Knutsford Wedding Gallery. I just wanted to say a big thank you to you both for helping me find my dream dress last Friday 18th Oct. It must have been fate that made my mum and I come into your shop that day and then for you to pick the dress off the rail, it was just all too perfect! Camilla, you made me feel completely at ease thank you so much. Your shop is beautiful and the service was excellent and my mum and I both appreciated how comfortable you made us feel. Thanks again and cant wait to come a visit you again to see my beautiful dress. I am still overjoyed that my dream dress was so perfect on Saturday, I cant stop thinking about it! Wedding Dress is bought! Thanks so much to the lovely ladies at Knutsford Wedding Gallery – if anyone out there is looking for their dress you have to go here! I have my dream dress!! Thanks to my Mum and Dad, thank you so much! I feel truly blessed! Also thank you to the lovely ladies at Knutsford Wedding Gallery for helping me find my perfect dress. Just had my first wedding dress shop experience day at the most AMAZING wedding shop! Fab girls really know their stuff. Thanks so much Knutsford Wedding Gallery! I just wanted to thank you again for making my two visits so enjoyable. I really do feel that you go the extra mile to make it perfect. It was lovely meeting your daughter today, she is a true credit to you! Thank you for helping me to find my dream dress! I just wanted to let you know what a lovely experience it was trying on dresses and how welcoming and comfortable you made me feel. Your dresses are all absolutely exquisite. Please can you thank Camilla personally for me as she was absolutely lovely and really put me at ease. I will personally be recommending you to my clients and would like to thank you all again for making it such a lovely experience. Thank you so much for yesterday, Katie is thrilled with the dress and I’m still teary eyed! It is stunning…will make sure you get some pics of the day. You were so helpful and made the process so easy, and you dresses are all beautiful. Will be in to sort the bridesmaids in the new year. I just wanted to say thank you again, so much for Saturday! I think I am still overwhelmed by it all! You made me and my mum so welcome and special. So many bridal shops rush you once the hour is up that is allocated to you, it was so nice how you give everyone 2 hours with no pressure to purchase – you both felt more like friends. I cant believe I have found THE dress already, I knew it was the one when we both filled up (eek!) I cant wait till May – June next year when I come in for the measurements/alterations although I may be in before to try it on again! I wish you every success and more with you lovely business (not that you will need it) and I will be recommending you to everyone! My husband and I would just like to say a massive thank you to you both for your help making our day so special. Matt loved the dress 🙂 and so many other people commented how lovely it was. Thank you so much for all your help and support in helping me find my perfect wedding dress – Ive had a fantastic experience at Knutsford Wedding Gallery. I wish you continued success with your business its wonderful. Thank you so much for helping me find my beautiful perfect dress. From the moment I stepped through Knutsford Wedding Gallery’s door I knew I was in the best hands. This was the first place I came to and I didn’t need to go anywhere else. You both made it such an easy and pleasurable experience from start to finish and words cant explain how grateful I am. I had so many wonderful comments about my dress and I loved every minute of wearing it on our special day. I have highly recommended you to everyone I know and I wish you all the best in the future. Just wanted to send you some of the photos we have just had through! Our wedding day went perfectly and my dress (if I do say so myself) looked amazing!! The bridesmaids looked beautiful and the colour of the dresses fitted in perfectly with everything, they were such a gorgeous colour. Thank you again for all over your help in finding us the perfect dresses and for getting us all fitted on time. I just want to do it all over again now! I would like one more time to say thank you for everything you did in relation to my wedding dress and the veil, you and the girls in the shop are really great and I had an amazing time through out all the process of choosing and the fittings of the dress. Our wedding was on the 20th of july, and we had the time of our lives, it was like a dream, everybody loved the dress, I got tones of compliments on it, which made me more proud and happy to tell everyone that I got it from your shop in Knutsford. I will be around Knutsford after the 9th, so i will try to pass by the shop if I can. I just wanted to thank you for a really wonderful experience on Friday. I am so happy with the dress I chose and keep looking at the pictures without a single doubt or hesitation that this is my dress. You really made the experience really special and relaxed for me and mum and for that I will always be very grateful. I asked you why you went into the bridal business, I now see how obvious it is you help people get that truly special moment that I never imagined I would have. I wanted to thank you from my heart. To all at the Wedding Gallery Knutsford, Thank you for saving me and my daughter from trolling round the country looking at any more wedding dresses. You were the sixth one and head and shoulders above the rest. This is not just because of your selection of beautiful dresses but also because of the professional and knowledgeable manner in which you advise and help the bride on what dresses to try and what little tweaks can be made to suit. A very personalised service. The dresses, the designs, fabrics and the cut are in a different league to those we have seen elsewhere. Very classy. The alterations you suggested were inspired and exceptionally reasonable, certainly compared to London; you really made us feel that you wanted to make sure we were happy with everything including the cost! The end result: a designer dress with a bespoke tailoring and, I have every confidence , a very happy bride. We were a party of three and were made to feel very welcome – nothing was too much trouble . We were there a good two hours before the bride-to-be decided on ‘the one’. It was a perfect moment the three of us shall always remember, made all the more special by the gorgeous surroundings of your stylish shop. Lunch in the picturesque village of Knutsford helped to make the day a day out to remember. Despite the not insignificant 4.5 hour drive for my daughter, we are looking forward to the fittings already.